Discipline tells a child that you care enough about him and want him to behave in a manner that you know to be right. Be sure your youngsters know what kind of behavior is acceptable during your Bible club program, and set limits and boundaries for them while they are with you. It’s unfair to punish them for breaking rules they didn’t know existed. 1. Establish the necessary standards and limits at your very first Bible club meeting, and make sure everyone knows what they are. Keep the list short! 2. Consistently enforce the standards. If they’re not worth enforcing always, for everyone, they’re probably not worth having. 3. Be reasonable in your expectations. “No talking” is not reasonable. “No talking during prayer time or when someone else is speaking” is a reasonable rule and should be enforced. Simply stop talking until the offender realizes he’s the cause of the problem. Your silence should be sufficient. The second time it might be necessary to say, “Ricky, you’re interrupting our story. Please stop talking so I can continue.” If it happens a third time you might say, “Ricky, the next time I have to stop this story because you’re talking, you’ll have to leave the group.” Then be sure he’s removed (quietly) if it does happen again. 4. State your expectations before transitioning to a new activity. Let children who attend your Bible club regularly repeat the expectations for visitors to hear and as a reminder to everyone else. Be sure to restate the expectations each week and before each activity. Don’t expect children to automatically remember to raise their hands before talking if you haven’t reminded them. 5. Be logical about punishment that must be administered. Don’t make a federal case out of a minor infraction, or you’ll have to send a major offender to jail! If a child smears glue in another child’s hair during craft time, separate the offender from the glue for the evening, or have him work alone at a table. Children do bizarre things at times on impulse — usually to get attention! Once you’ve established your standards and enforced them firmly and fairly for a while, the best rule to follow is to assume that each child can be trusted to handle his own behavior until he proves otherwise. Let the youngsters know that this is what you expect now. Then, when a child misbehaves, you can let him know that you’re disappointed that he isn’t ready to be in charge of himself in the group, and that you’ll have to help decide where he should sit, and whether or not he can work with others. Make it clear it’s the behavior you’re disappointed with — not the child. When the child and you determine that he’s ready to try to be in charge of his own behavior again, emphasize how much you want him to be successful this time. Children who have serious problems at home will test you to see if you really care about them. Some will try your patience to the limit before they’re convinced you really like them. You can usually spot such children during your first Bible club meetings. They’ll be doing everything possible to get you to notice them. Love and discipline are inseparable. Love wants what’s best for the loved one. The product of no discipline during a child’s early years is irresponsibility, which leads to lack of self-respect, and can mean an unhappy, unproductive adult life. Find some strength or asset in each child that you can commend him for. If you’re sincere, he’ll know it — and your efforts will be rewarded. Make a point of emphasizing the positive qualities of every child each week, no matter how hard you have to look to find them sometimes! Reward the positive behavior and try to overlook the negative as much as possible. One primary goal of your time with the children is to provide opportunities for leadership training, but you can’t develop leaders out of children who don’t believe they have worth, or who have a poor self-image. 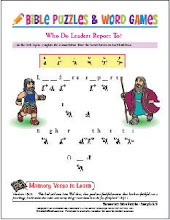 While these basics will not solve every discipline problem you may encounter in your Bible club class, they will go a long way to making sure your Bible club program is happy and fun—an environment where the children can effectively learn about their heavenly Father and His Son, Jesus.